First of all what is Miso? It is a fermented soybean paste used in Asian, especially Japanese, cuisine. It’s traditionally made by combining soybeans with salt and a special starter called koji and fermented up to 3 years. Something I did not know, is that miso can be made using other beans such as garbanzo and black beans and other fermented microorganisms. There are many types of miso, including hatcho, kome, and mugi miso, depending on what grains and other ingredients are used, how much salt is added, and how long it’s aged. Miso paste is essentially a mixture of cooked soybeans, a fermenting agent, some salt, and water. Think of miso as similar to beer; ranging from ivory to a deep chestnut, the taste can vary from mild to full-bodied and rich. There are many kinds of miso out there. A general rule of thumb: richness intensifies as the color gets darker. Because it does contain a high sodium it should be used sparingly, there are sodium-reduced versions, but they still contain a lot of sodium. Each miso contains it’s own special “umami flavor, that is the variations of earthiness and salty- sweetness. For me, that salty-sweetness is miso’s winning flavor combination and part of the magic of miso. White miso, one of the more familiar types of miso, has rice as its main ingredient and a small percentage of soybeans. Its fermentation time is also the shortest, making it a mild and slightly-sweet miso — perfect for salad dressings and marinades. Red miso has been fermented the longest, and can range from a red to a deep brown color. The flavor is concentrated and intense — a little goes a long way. Use this miso with heartier dishes and meaty, sturdy vegetables like eggplant and asparagus. You probably will not use miso alone because of its high salt content and potent flavor, it just does not taste good alone. Think of it as an flavor ingredient. Also miso doesn’t blend completely smooth, so a blender is required if you prefer an extra smooth consistency. Miso broth is a familiar soup to many from dining out. However if making a simple miso broth, do not boil miso directly, which is said to “spoil” it, killing some of the aroma and flavor. 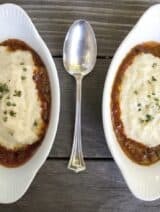 If you are adding miso to a simmering liquid, gradually add the paste a little at a time and continue stirring, keeping the heat at a low temperature. Miso is best when stored properly. Miso must be stored in the refrigerator, where it will keep for months, after opening the seal from the package should be touching the surface. 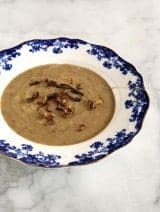 Here are 4 of my favorite miso paste recipes which are a great and simple introduction to cooking with miso. 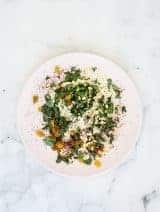 First up are two salads that use my favorite Lemon Miso Salad Dressing a great place to start when cooking with miso. 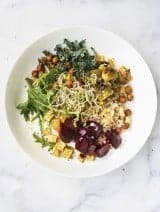 Market Basket Salad with Lemon Miso Dressing, uses whatever greens and veggies you like, tossed in a creamy-lite lemon dressing. Here mild White Miso joins with fresh lemon juice, Dijon and a dash of sesame oil. The miso thickens the dressing nicely, and this dressing also makes a great dip for raw vegetables. I often packed this salad, along with some nuts for a healthy-good lunch. This dressing also garnishes the Autumn Roasted Vegetable Salad. Fall favorites such as sweet potatoes, Brussels sprouts and roasted chickpeas, just add greens of your choice and a cooked grain. This salad is a satisfying fall lunch or light dinner. Next recipes are more Miso magic – creating a delicious glaze for baking and roasting fish and vegetables. Quick Miso-Glazed Salmon uses the rich red miso paste to create a salty-sweet glaze. It really is a simple, yet succulent recipe for salmon – no special cooking credentials required. One of my favorite, and frequent uses for miso is in creating a Maple-Miso glaze for vegetables. My favorite carrot recipe is found in my second cookbook, From the Garden. 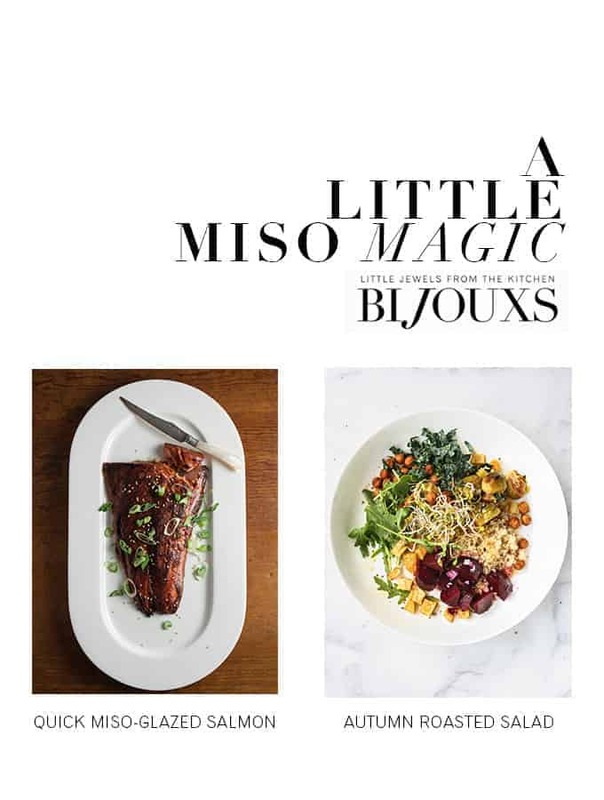 Miso creates a little magic in recipes, a favorite Little Jewel in the Bijouxs kitchen.